All teenage girls have a love for fashion. I can pretty much guarantee that if I conducted a poll asking how many of you dream of a career in fashion, the results would be impressive. Many of you particularly dream of being a fashion designer. It's always fun to have dreams, but fulfilling those dreams can be a lot of work and take both natural talent and learned skills. Therefore, I've created a guide with lots of resources to help you aspiring fashion designers on your quest for stardom. If you want to be a fashion designer, the first thing you will need to know is how to sew. It sounds like common sense, but it's rather surprising how many teenage girls today have never picked up a sewing needle. Of course, there are non-sew design techniques, like print screening and knitting, but in many cases you'll need at least a basic knowledge of hand sewing. I also highly suggest buying a sewing machine and a serger and learning how to use them. Check out Heather, age 22, from Meow Kiki's tips for buying good machines from her October '07 feature article in SDM (Advice for Aspiring Fashion Designers). Like anything else, learning to use these machines is a skill and will require a lot of practice, and even (ahem) ... patience. 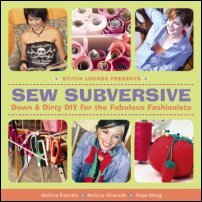 Awesome books like Sew Subversive and Subversive Seamster offer valuable sewing skills, techniques, terminology, choosing the right fabrics, and lots of project ideas and tutorials. 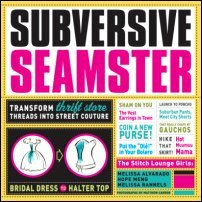 In Subversive Seamster, the authors even show you how to make your own dress form using duct tape! How fun - and a valuable sewing tool, I might add. 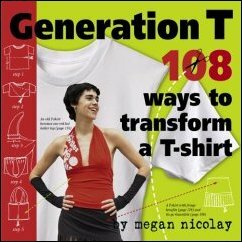 Another book I suggest, especially for beginners, is Generation T: 108 Ways to Transform a T-Shirt, by Megan Nicolay. The book is a personal favorite, and excellent for anyone from beginner to advanced, with over 100 projects (plus 200 variations) from level one simple cut, tie, and hand sewing projects to level four and five bags, patchwork blankets, and even a wedding dress! Who would think to transform your old t-shirts into pillows, ponchos, and skirts? You don't even need a sewing machine for most projects, but for some it would be considerably faster. I promise you'll have fun and learn a lot! Zest Books has published two books that are beneficial for aspiring fashion designers. Fashion 101: A Crash Course in Clothing is the only encyclopedia of fashion for teens, which chronicles more than three centuries of fashion with full-color illustrations. For each fashion item, Fashion 101 describes what it looks like, the era that inspired it, who made it hot, and how to rock it. 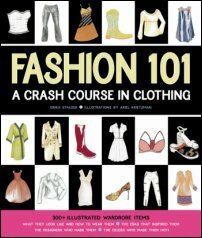 This book is a must-have for every fashionista! Indie Girl, as you may have read in my March '07 article (Indie Girl), offers excellent tips and resources to launch a fashion company. The amazing thing about 2008 is there are many opportunities to find inspiration. It seems like no matter where we go, inspiration is around us in some media form. Just by searching the internet you can find some really good (and some not so good) fashion websites, blogs, and forums. One of my favorite YouTube shows, "Threadbanger", offers extremely creative project tutorials and fashion design techniques and tips. I highly suggest visiting their website at Threadbanger.com and participating in their forums as well. You can also view shows on their website or YouTube at youtube.com/threadbanger. I recommend purchasing subscriptions to magazines like Teen Vogue and Elle. Top fashion magazines are great sources for inspiration and help in spotting fashion trends. Teen Vogue is perfect if you're in your early to mid-twenties or younger - or if you're looking to design for a teenage audience. If you're interested in high fashion, it's nearly impossible not to be inspired by the designs you see spreading Elle's pages. Elle also provides excellent coverage of Fashion Week in New York, Paris, and Milan on their YouTube account (youtube.com/ellemagazine). To get more coverage, simply google Fashion Week. On the television show Project Runway, it's always interesting to see the different styles and techniques that each designer brings to the table. As many of you already know, Season 5 premiered on Wednesday, July 16 on Bravo. Project Runway, America's Next Top Model, and The Hills each provide a glimpse into the fashion industry and what goes on behind the scenes at runway shows. Sketch, sketch, sketch! No idea is too silly to sketch. Whether you think of a totally original design or see a fashion item you would have designed differently, sketch it. I suggest carrying around a 5.5 by 8.5 inch sketchbook with you wherever you go, so when inspiration strikes, you'll be ready. That's what extra large purses are for, right?! It's also good to have a large sketch pad at home that you can attach fabric swatches to. Once you have a few sketches drawn up, construct them using the necessary equipment. Get feedback from friends and on forums like Threadbanger.com to learn how you can improve your designs and techniques. Remember, the more you practice, the better you'll get. TIP: Take and store photos of everything you design! You don't need to be Marc Jacobs to host a fashion show. In fact, planning and hosting your own show would be an amazing experience for anyone. All you need are some clothes (of course), a location, and some friends. You can take your show a few steps further by offering snacks, conducting an auction, and filming it to post on your website or YouTube. 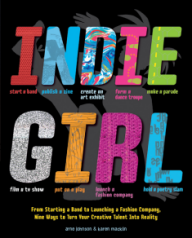 The book Indie Girl offers some helpful tips to plan your show. 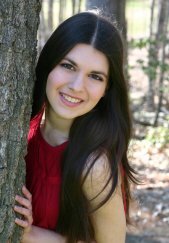 An excellent example of a teenager who has put on her own fashion show is Kayla and her Green Awakening. Kayla didn't actually design the clothes, but rather contacted designers from around the world, asking them to donate environmentally friendly clothes and accessories. After the show she auctioned off everything, with more than $1,500 of proceeds going to the Sierra Club. You can learn more about Kayla and Green Awakening by visiting the Sierra Club's blog: http://sierraclub.typepad.com/scrapbook/2008/04/green-awakening.html. Although many young people either ignore or don't take seriously the importance of networking, this is the most important part of your fashion career. Yes, it will be time consuming and even difficult. But if there's no one to buy your designs, then your career will die - or never take off in the first place. Heather from Meow Kiki gave us some great tips regarding networking and marketing in her October '07 article (Advice for Aspiring Fashion Designers). Once you've decided to take fashion design to the next level, set up a website to showcase your work and start selling on sites like eBay and Etsy to build a "fan base". Sign up for various social network websites to connect with your fans and share news. Remember, tons of blog writers are looking for up and coming designers to feature, so don't be afraid to market your products. Be sure to check out Heather's article "Advice for Aspiring Fashion Designers" for more tips! Once you've learned some of the basics and decide that fashion design is really what you'd like to pursue for a career, then you should start looking into colleges. There are a lot of colleges out there with fashion majors, such as Savannah College of Art and Design, Academy of Art University, Fashion Institute of Technology in Manhattan, Fashion Institute of Design and Merchandising, and Parsons, to name a few. There are hundreds of schooling options, so be sure to look into local schools as well as big names. Start to seek out internships during your junior year if working towards your Bachelor's degree. Getting real work experience is always a great idea before graduating college and beginning your career. Finally, look into how notable fashion designers got their start. No one's path is exactly the same, but reading and understanding someone else's story will help keep you motivated and give you ideas as you work toward a career in fashion design. Also, locate a mentor while you're in college to help provide real life help and tips as you begin your career. Knowing someone who's been there and willing to fill your brain with life experience will help you avoid pitfalls and seek out productive paths. I hope that my guide to starting a career in fashion design has been a help to you. Remember to always work hard in all that you do! Always be sketching and designing. Gain experience within the fashion industry whenever you can, even if you're just volunteering at a fashion show. You never know what opportunities might open up for you when you work hard!